In Tessa McWatt's new novel a cast of characters confront their own private battles as they attempt to forge lasting relationships and seek out love. Whether it's Francine, the bulimic University administrator who can't seem to figure out when she let her dreams pass her by, or Robin, the young film lecturer who has got his ex-girlfriend pregnant and fallen in love with Katrin at the same time, McWatt's story paints an intimate portrait of her characters' lives and innermost thoughts. As is typical with a lot of multistory novels, there were plot threads I enjoyed more than others. Francine was a complex and interesting character struggling in the wake of the accident she witnessed. Her story arc comes to a satisfying close at the end of the book. Similarly, Olivia's journey from uncertainty to self discovery is engaging, and sections which focus on her father, Ed are especially warm and tender. McWatt captures the total and complete love a parent has for a child in a very moving manner. The book is not only about the characters though, and confronts a host of timely themes such as austerity Britain and the way people cope with the potential for redundancies, EU immigration is dealt with via Katrin's storyline and her struggles to make ends meet in order to facilitate her mother's move to the UK. Perhaps most interestingly though, as Olivia's final dissertation leads her to the funerals of the many lonely souls in the city, people who had no one, I could not help but feel the author was touching on the isolation which can occur in a city such as a London. 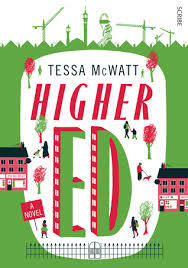 Higher Ed is a warm and serious novel with some likeable characters who are all in search of the right way to live. Thanks to Scribe Publishers for providing me with an advanced copy in exchange for an honest review.